There has been a buzz around this film for months, with the world and his mistress telling anyone who will listen just how stunning a film it is. But we've heard it all before right? These things just set the film up to fail, no? You see, this time, they're right. 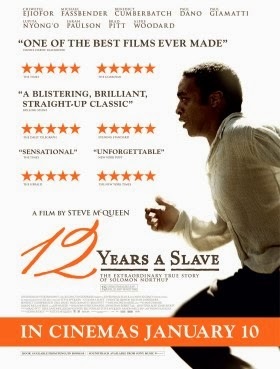 Telling the tale of one Solomon Northup, an upstanding member of his New York community and a fine musician, Slave takes us through the harrowing details of when Solomon was kidnapped. Based on the man's own book, we are shown - in explicit detail - how human beings were traded as animals, treated worse than animals, and how one man managed to find his way back to his family (this is hardly a spoiler, given he couldn't have written the book while working the cotton fields). But don't be lulled into thinking this is some schmaltzy Hallmark gubbins - it's anything but. The violence the slaves suffered, the arrogance and hatred of their "owners" is laid bare in brutal detail, with people whipped with such severity you feel guilty for watching. OK, not fun, but it's gripping, enthralling, captivating, beautifully shot and there's not a bad performance in the whole damn thing. Most of this is down to Chiwetel Ejiofor, whose performance in the title role is nothing short of spellbinding. He not only captures the struggle and bewilderment of Solomon perfectly, but also brings to the fore such passion and humanity you feel you've picked alongside him under the Southern American sun. Having, reportedly, not been keen on taking the part, you watch him knowing no one else could have done this. No one else could have made you feel for Solomon the way he has - and he deserves every award that is set to litter his bookshelves in the coming months. But he's not shining amongst a bunch of no-marks, oh no. His performance is further highlighted by just how good his co-stars have to be to keep up. Michael Fassbender is brilliantly brutal as Edwin Epps, the farm owner who becomes the final owner of Solomon, while Brad Pitt is wonderfully understated as the only man who actually tries to help Mr Northup. Then there's Benedict Cumberbatch, Paul Giamati, Sarah Paulson and Lupia Nyong'o - who, going by this film debut performance, is set for a seriously HUGE career. But it's not all about the performances. I mean, it is, sure, but it takes a delicate hand to tackle this story and this many stars and bring to the screen such a balanced, heartbreaking, uplifting yet harrowing tale. Which Steve McQueen has done. In only his third feature film (although let's not forget the plaudits his first two, Shame and Hunger, received), McQueen has produced a work of simple brilliance. Not only does Slave look beautiful, but he brings the drama and cruelty to the fore in a way which is emotionally devastating. Yes, the violence is strong - but that's what happened back then. McQueen isn't revelling in it, he's laying it bare to make the point that certain members of the human race were lacking in humanity. And that's the point of this film - that this actually happened. A free man was kidnapped and sold into slavery and there was nothing he could do about it. Like Long Walk To Freedom, this is a story that needs telling. But unlike the Mandela biopic you don't come out of it feeling you've been smashed over the head by the very book the film is based on. No, this isn't an 'easy' film to watch - the beatings are bloody and frequent, and hangings happen more often than you'd like to know about.